I haven't been in the mood lately to do much cooking at all the last little while (morning sickness will do that to you! ), but last week I ventured into the kitchen a little bit and actually made a few things, like these Citrus Bars from Stressed Spelled Backwards. I didn't do the candied citrus slices for on top, and I kind of messed up with the almonds in the crust, but they still tasted great! 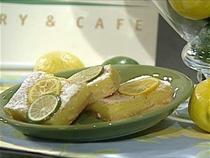 I loved the lemon and lime flavors together, and adding the rind gave a nice, rich flavor. I'll definitely make these again! It seems like there was another recipe I was going to share, but for the life of me I can't remember what it was, but when I remember, I'll post that one too. I have a new favorite weight watchers-friendly cooking blog, Chubby Chica! I tried out her sloppy joes last night and I couldn't get enough of them! I ate two sandwiches, oops! I had to modify them a bit with what I had in my pantry, so I included my adjustments in parenthesis. Heat large nonstick skillet over med. heat. Assemble first 3 ingredients, cook until beef is browned. Stir in tomato sauce and next 8 ingredients. Reduce heat to low and simmer. Cover and cook for 20 minutes, stirring occasionally. Spoon 1/4 c beef onto bun. Serve. I saw this fun idea in a magazine and tried it out the other day. Take some spagetti noodles, uncooked, and pierce them through hot dog pieces. Boil according to the noodle directions. Serve with ketchup or any other fun dipping sauce. I got this recipe at my last WW meeting, and since I had some whole wheat flour left over from making bread the other day, I just raided my pantry for the rest of the ingredients and went to work. They turned really great, the kids couldn't stop eating them! I had probably a few too many myself too, oops! Preheat oven to 350 degrees. In a medium bowl, combine oats, flour, baking powder, salt, and cinnamon. Set aside. Using an electric mixer, cream butter and sugars until incorporated. Add gg and vanilla, mix thoroughly. Add oat mixture and mix until just combined, fold in raisins. Drop rounded teaspoons of batter about 1 inch apart onto 2 ungreased cookie sheets. Bake for 9-10 minutes for chewy cookies or 11-12 minutes for crisper ones. Remove from oven and let cookies rest for about 2 minutes, then remove to a wire rack to cool completely. Last night was Mexican night, so I took some left over shredded chicken and put together a quick and super yummy enchilada casserole. It took a lot of self control to not go back for seconds! Coat a 2 qt. casserole dish with non-stick cooking spray. Spread a thin layer of sauce along the bottom, then layer lasagna-style in the following order: tortillas (broken up in quarters), sauce, chicken, cheese. Repeat until your dish is full, but don't add the cheese on the top yet. Bake at 350 degrees for about 15 minutes, then add the cheese to the top. Bake for another 15-20 minutes until hot and bubbly. I haven't done as much exciting cooking lately so I haven't had as much to share, but I tried a little experimenting the other night and I think I found a new favorite rice dish! I got a rice cooker for Christmas and it is my new best friend in the kitchen. If you don't have a rice cooker, though, I think it would probably work just as well on the stove top, just follow the directions on the bag for cooking time. Crush the bouillon cubes in the water, mix the carrots with the rice, and cook! I served it with some broiled fish and steamed broccoli and it tasted so yummy!